It looks like the NHL’s Chicago Blackhawks hockey team has filed a UDRP at the World Intellectual Property Organization to try and seize control of the Blackhawks.com domain name. The UDRP filing is WIPO Case D2018-2064. The complainant is listed as Chicago Blackhawk Hockey Team, Inc. The message at the top of the domain name landing page indicates it may be for sale, but the inquiry form does not have a price. 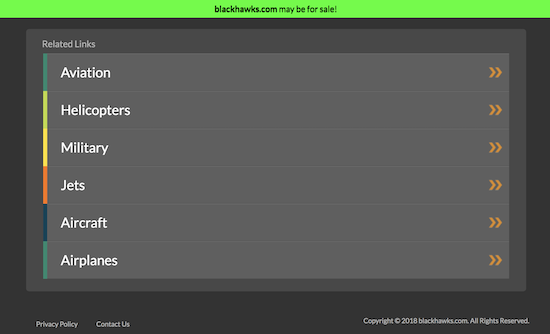 I looked through my email records, and I do not see any emails from broker newsletters offering BlackHawks.com for sale at any time. It looks like the NHL hockey team promotes ChicagoBlackhawks.com for its url, although that domain name forwards to NHL.com/blackhawks. The NHL’s Chicago Blackhawks team was founded in 1926. The team’s domain name was created in June of 1997. It will be interesting to learn more about this UDRP when a decision is rendered. I am curious to know if the NHL team tried to buy the domain name first and if the UDRP filing is their “Plan B” attempt to secure the domain name. The NHL team will need to prove the owner registered and is using the domain name in bad faith. Considering none of the links are related to the Chicago Blackhawks team, it could be an uphill battle. Update: The NHL team won this UDRP. As long as the registrant responds, looks like a RDNH case. It’s probably the same owner since before the WHOIS info went dark. Apaches.com is still parked because Apache Web Server and Boeing Apache Helicopters understand at any given time a big league team might need it. The Blackhawks should file a supplemental UDRP against Apaches.com in the event they decide to base a name change on the outcome of either case. The most interesting move The Blackhawks could make is change their name to The Pulverizors and hand register Pulverizors.com for $15. What hockey team in their right mind wouldn’t be intimidated facing an opponent with this name. Everyone goes to the games to get pulverized. Not sure what Blackhawks are thinking here. They must have something regardless of how trivial it might be. Maybe screenshots of old PPC pages or something in previous emails/communications with domain owner they construed as demonstrating bad faith. I used to work with NFL and NBA legal, not NHL though, only their marketing. It appears Chicago Blackhawks filed this UDRP and not NHL legal department, which is odd because NHL is fairly centralized and IP/domain issues typically handled on league level. NFL most decentralized of major sports leagues ie team owners have more control. Which kind of flows into the Cowboys.com saga. Jerry Jones doesn’t have the same deal with the NFL as the other 31 owners. Jerry Jones owns rights the other 31 owners don’t regarding team licensed IP, manufacturing, and product distribution. He can tell the NFL to pound sand, they don’t have any real leverage over the Cowboys. I reckon if this same situation happened to one of the other 31 NFL teams the issue wouldve been resolved promptly, ie the NFL would’ve just paid up. But Jerry Jones calls his own shots, and for some reason has refused to bend so far. Id bet they asked how much, didn’t like the price and went complaint. I hope hey get what they deserve, nothing but a RDNH label.